Adrian Tchaikovsky and Justina Robson kick off an inventive, satisfying shared universe with a difficult past. Oh hey, a shared universe! In books! Perhaps I'm not reading the right things, but this feels like a pretty rare occurrence, and aside from George R. R. Martin's Wildcards series (which I haven't read) and the occasional posthumous series continuation, I'm struggling to think of any intentional collaborations of this kind. 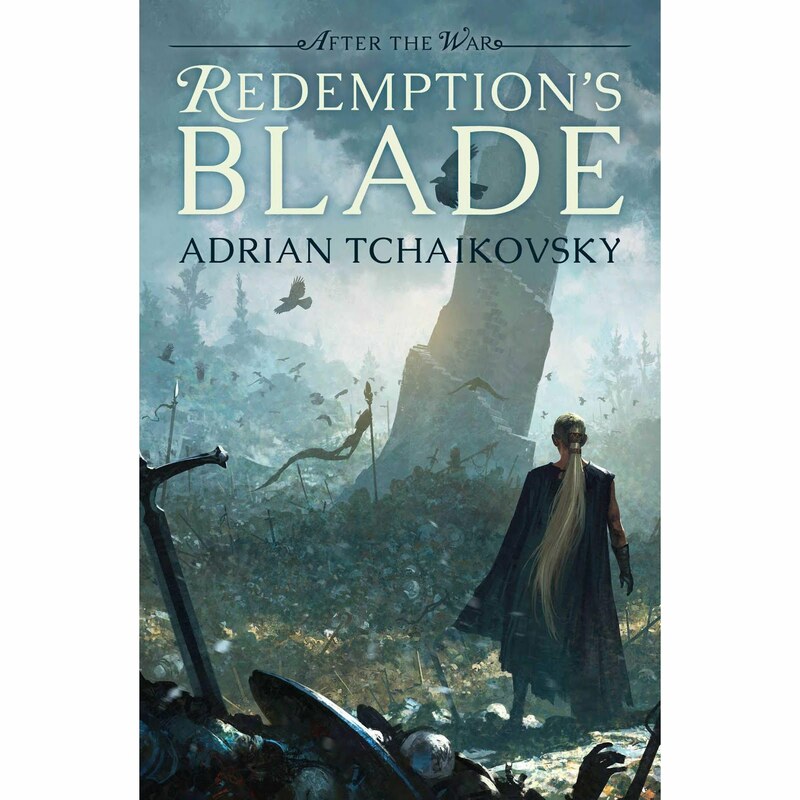 Redemption's Blade and Salvation's Fire are a sequential pair which together open the "After the War" series. Redemption's Blade - and, I believe, the concept for the whole world - was written by Adrian Tchaikovsky, who is fast on his way to becoming one of my favourite authors; Salvation's Fire continues with Justina Robson, whose work I hadn't read before. 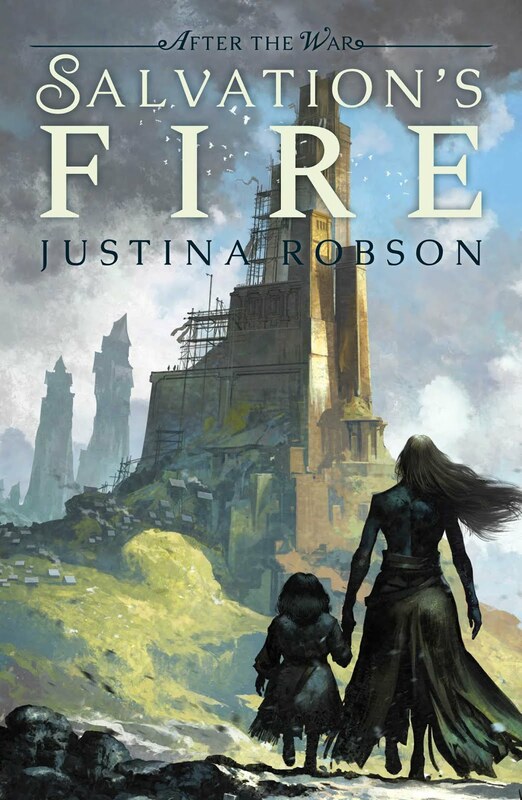 The series is set in a multi-species fantasy world which is dealing with the aftermath of a demigod's warmongering. The Kinslayer was defeated at the battle of Bladno, a battle Celestaine remembers all too well - she was there, dispatching his giant dragon-thing and helping to bring him down. Now the world is full of the kind of horrors that only a demigod on the warpath can inflict, and Celestaine and her pals are driven to try to make things just slightly better, one quest at a time. And it's definitely quest-driven fantasy that's on the menu here: there's no political post-conflict reconstruction going on here, no leaders arising from the ashes or chosen ones returning to their rightful thrones. There's just people doing their best, in the absence of much else to occupy them. The fantasy world here is probably best described as "Legend of Zelda except society makes sense". Humans share their world not with Tolkien-issue elves and dwarves but with the (formerly) winged Aethani, the water-dwelling Shelliac, forests full of ethereal Draeyads (some of which are now eternally on fire), some spider people (a Tchaikovsky special! ), and most prominently, the Yorughans. The Yorughans are After the War's "always chaotic evil" race, subterranean dwellers who were brought out and conscripted into service by the Kinslayer and whose members now have rather a lot to do to rehabilitate their species (not least because, actually, many of them actually quite enjoyed serving in the war, service to evil aside). Celestaine's two closest travelling companions, Heno and Nedham, are both Yorughan, and bring a pair of interesting, sceptical and frequently funny perspectives to her human outlook on the world. Also present are several of the Guardians, ageless beings created by the Gods who are now basically the only divinity left after Kinslayer (himself a Guardian) severed the Gods from the world as part of his campaign. Despite their divine origins, most of the Guardians are pretty human in their motivations and emotions: because of the war, it's only the less heroic of the group that have even survived, meaning that most bring a blend of cowardice and self-preservation to the table (nowhere more obviously than Deffo, "The Undefeated", who maintained his title through the war by hiding as a badger). Taken as a whole, everything feels brilliantly lived-in and the sense of both ancient and recent history really lifts the worldbuilding to another level. Celestaine is a compelling main character, although she's got more going for her in Redemption's Blade, where the plot is driven by her desire to make amends for one of the war's greatest atrocities, than in Salvation's Fire, where she ends up being more of a passenger on a trip belonging more to other characters. This is a shame, because Salvation's Fire introduces some cracking supporting characters, including the Bride of Kinslayer, who skirts close to being a fantasy manic pixie dream girl but ends up something much more interesting and dangerous, likely due to the influence of youngster Kula; there's also Tricky, a Guardian who appears to represent change and chaos as manifested in a gloriously snarky middle-aged woman, and whose interactions with returning bard Ralas were a constant highlight (and a ship I gave my blessing to). That said, Redemption's Blade gives us the fabulously amoral duo of Dr Catt and Fisher, who also haven't met a scene they couldn't steal. There's a real RPG-esque element to the character interactions in both books, which take as given that the characters will get together and stay together, using their different classes - sorry, character traits - to complete their various missions. As I guess you'd expect from a shared universe set-up, the plot of each book is self-contained, although character relationships do change and grow between books and we can assume that the set-up for a future Book 3 will continue that trend. As noted above, Celestaine is very much the driving force for Redemption's Blade: she's seeking Kinslayer's magic crown, which she has promised to Amkulyah, prince of the Aethani, in order to return the power of flight to his people. The crown itself is, of course, an effective tool to encourage the characters to travel and showcase some of Tchaikovsky's worldbuilding, as well as setting Celestaine and co. up for deeper questions on survival and reparations - with a world that's been ruined so badly, how can this one thing even begin to make a difference? Naturally, Tchaikovsky doesn't let his characters off easy with an artefact that can simply undo the past, and this nuanced payoff ultimately benefits the journey the characters go on to a far greater extent. Salvation's Fire, in contrast, takes longer to set up, and when it hits it's more the story of Lysandra, Kinslayer's manufactured bride. After being discovered by Kula (who has some mysteries going on herself), Lysandra provides the impetus for a trip across the ocean to find the ethereal plane the gods have disappeared to. Unfortunately, despite my love for Lysandra herself, this doesn't work as well as Redemption's Blade for the simple reason that Lysandra isn't a character with relateable, well-explained motivations, to us or to the other characters, and it feels like our returning characters end up following her more from lack of better things to do. Luckily, there's enough going on here in terms of the new characters and continued strong worldbuilding to smooth this over, and it all comes together in similarly nuanced fashion. From an RPG player's sense, it also just felt that we were too early in the characters' journey with us for them to be travelling into a parallel dimension to resurrect the Gods, and I don't think this plot brings the weight of the world's history to bear in quite as successful a way as its predecessor. Ultimately, this is the kind of heroic fantasy one reads for one purpose only: heroic characters doing awesome things. While Redemption's Blade and Salvation's Fire deliver a slightly inconsistent experience in that regard, the strengths of each volume still speak for themselves. Tchaikovsky and Robson both manage to walk a line between capitalising on satisfying heroic fantasy tropes and giving their characters moments of glory we can root for, while still making their post-conflict world dark and complicated and lacking in any easy ways forward. Its as deep as it needs to be, and the change in authors brings a fresh new take which outweighs the continuity niggles especially where some of the character growth is concerned. I'm hopeful that there are more adventures in store with Celestaine, Heno, Nedham and the crew, that I can come back to and scratch that heroic fantasy itch in a brilliantly inventive world. Bonuses: +1 Worldbuilding that delivers on every level (even the one involving giant spiders and voidcrabs); +1 Bursting with excellent characters across both volumes.